Alcohol consumption makes central nervous system unable to control body’s response to even minor blood flow fluctuations. Women are more susceptible to alcohol effects at all ages. 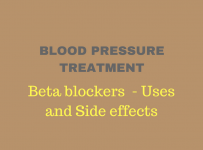 High Blood pressure medications may become ineffective or even toxic in the presence of alchool. Alcohol Drinking too much could increase your blood pressure. The opposite is true, when you drink occasionally and small quantities of certain drinks. Research evidence supports that moderate wine consumption could be beneficial for the health of your heart and arteries. National Institute on Alcohol Abuse and Alcoholism defines binge drinking as a pattern of drinking that brings blood alcohol concentration (BAC) levels to 0.08 g/dL. This typically occurs after 4 drinks for women and 5 drinks for men in about 2 hours. Occasional binge drinking could be harmful for someone with blood pressure to the upper boundaries. That is because those people are more prone to blood pressure spikes every time they exceed the limit of alcohol intake. Long term binge drinking can result in hypertension. 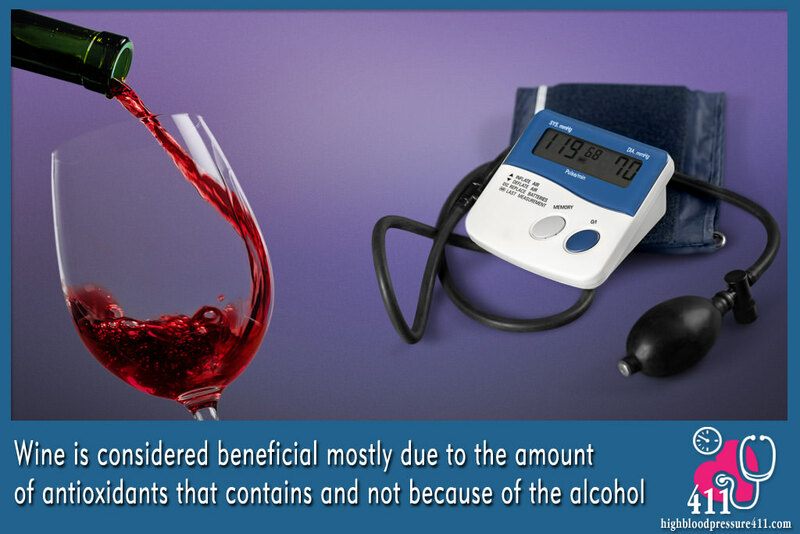 The exact mechanism through which alcohol affects blood pressure seems to implicate many factors. Chronic consumption may render central nervous system unable to control blood vessel response to even minor blood flow fluctuations. Apart from this, direct effects of alcohol on cardiovascular system could also contribute to the onset of hypertension. If body weight is an issue for you, keep in mind that many alcoholic drinks are highly caloric. When hanging out on a Friday night and you are supposed to have a drink with your friends, better opt for a glass of wine than a cocktail and try not to mix different types of drinks in one sitting or, even better, in the same day. Well, first remember that it is largely depends on how long you have been a drinker. If you are not a heavy drinker but you have discovered that alcoholic drinks causes transient increments in your blood pressure, then you may expect a drop to normal soon after you stop alcohol consumption. If you are a regular drinker of large amounts of alcoholic drinks, it is advisable to diminish it slowly. In case that you plan to stop drinking at once and for all, it is advisable to consult your doctor before, as you may have to deal with alcohol withdrawal symptoms like frequent blood pressure spikes. It must be pointed out that wine is considered beneficial mostly due to the amount of antioxidants that contains and not because of the alcohol. Obviously, if you don’t ready drink for any reason, you are not supposed to start drinking! Resvatrol is an antioxidant substance, found mostly in red wine. Scientific evidence supports that it decreases LDL cholesterol (the “bad” one) and protects from blood clot formation because it has blood thinner properties. Although it is available as nutritional supplement, it is most safe to consult your doctor before you use it. 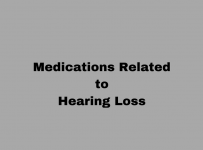 Apart from side effects, it could interact with certain medications (like warfarin, aspirin and ibuprofen) and increase the chance of bleeding. A woman’s body contains more fatty tissue than a man’s. Because fat has the property to retain alcohol, women brain and other vital organs remain exposed for a longer time to alcohol effects. Women organism lacks two specific enzymes that participate in the alcohol break down in stomach and liver: alcohol dehydrogenase and aldehyde dehydrogenase. As a result the effects are intensified because it stays longer in the blood stream. If you receive certain medications, you have to know that alcohol interferes with the metabolism of most drugs, and some of them could become toxic. This also applies to blood pressure medications, which in the presence of alcohol may become ineffective or even toxic. How does Alcohol cause Addiction? Any food or beverage consumed in big quantities, could be harmful for your health. Alcohol is a strongly addictive drug which causes central nervous system depression, by stimulating the release of certain message transmitting substances namely dopamine and endorphins. Endorphins are protein substances relased to the blood stream to make you feel better during an entertaining activity, acting to calm your stress, anger or even pain. Dopamine then follows in to create a rewarding feeling every time you are engaging to the same pleasurable activity, urging you to repeat this activity over and over. It has been found that endorphins are released when small to moderate amounts of alcohol are consumed, boosting in that way the addiction. Spending most part of the day drinking or thinking about to drink. Risky behaviors such as drunk driving. Denial to admit that too much drinking is a problem. Inability to give up drinking. Prepare for a new life. Make a plan of your future activities, entailing unfinished projects and neglected family duties. Ask your doctor about whether you should consult a specialist in addiction treatment. Think about health consequences of binge drinking. Set realistic goals. Do you want to stop drinking once and for all or just reduce the amount. Think about the cost in money and impact on your relationships. Set a specific quit date and be consistent. Tell your friends and family about your decision. Ask them to be supportive and understanding. Also make clear that you will not be able to attend for a while, any event involving alcohol consumption. Avoid temptations: get rid of any kind of alcohol-containing beverages. The symptoms could begin as soon as two hours without alcohol and may last for weeks.